Similar to Concentration, this printable board game tests your child's memory and focus. Players take turns looking under pennies to find matching pictures. Have an aspiring sports fanatic on your hands? Give him a great game and a fun way to practice memorization skills with this game. This memory game is mind-bending! Test your memory skills and see how many letters of the alphabet you can match up. Cinco de Mayo Find It! Help the participants of this Cinco de Mayo parade find their sombreros! Embark on a Halloween hunt with this fun printable which challenges kids to find the spooky shapes and eerie objects hiding in this trick-or-treating scene. 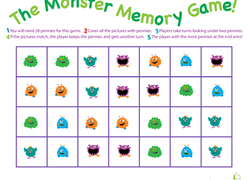 Prep your first grader for study skills with a fun memory game! He'll try to match up the equal money signs from memory. Who knew that pirates and study skills could go hand in hand? With this memory match-up game your child will build memorization skills. Liven any road trip with a fun travel memory game! This one involves coloring too, and will challenge your child to re-draw a picture from memory. Test your first grader's memory with a fun match-up game! Your child will try and match up the pairs from memory when they're face down. Test your memory with a festive game that celebrates the snowflakes, trees, stockings and bells of the Christmas season. This memory game is all about coloring. Your child will try to memorize all the features of each picture, and re-create them without peeking! Here is a fun game that combines memorization skills and getting familiar with different ways of telling time. Exercise your child's memory skills with a fun and challenging match up game! She'll try to remember the location of each pair while they are faced down.